If you’re looking for a fun read for tweens and middle school girls, here’s a great choice. 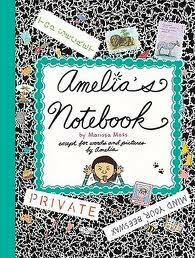 Marissa Moss’ Amelia Notebooks are written like diaries that look like composition books full of Amelia’s writing and her many drawings. Amelia is 10 and has an older sister named Cleo. They act a lot like you’d imagine an annoying younger sister and a more annoying older sister might act. Amelia’s sewing project is a disaster, and she’s really nervous about her teacher’s suggestion that they have a fashion show with everyone modeling their projects. Her big challenge though, is making a science project that will impress Oliver enough that he’ll invite her to go the state science fair. Amelia loves science and is dying to go to science fair. Will Amelia get through the fashion show and get to go to the science fair? Will Cleo figure out that it’s better to be yourself than to try to change yourself to get someone to like you? Read this fun book to find out and enjoy the entire series of Amelia’s notebooks! As a note, our school was lucky enough to receive an author visit from Marissa Moss. She did a great presentation and writing workshop for our sixth grade. Yay, Marissa! Moving through my summer reading list, I took on a a historical novel, Kira-Kira, by Cynthia Kadohata, a fairytale adventure, Robe of Skulls, by Vivian French, an environmental novel, One White Dolphin, by Gill Lewis. Kira-Kira is a powerful, Newbery Medal-winning, story of the strong bond between two Japanese-American sisters living in Iowa and Georgia in the 1960s. Katie’s sister Lynn best friend, her mentor and the person that taught her that kira-kira means glittering. Kira-Kira takes many forms: stars in the sky, the sea, people’s eyes. Katie’s family struggles. Her family moves to Georgia where her parents find work in chicken hatcheries owned by a very rich man who does not treat his workers well. Katie’s parents work around the clock to make a living and are are devastated when Lynn is diagnosed with a terminal illness. 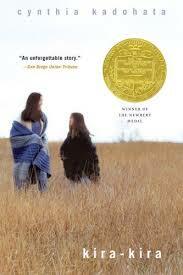 I was really touched by the beauty and the sadness of this book. I loved the portrayal of Katie’s strong love for her sister, her quirky but sweet Uncle, her hard-working parents, her love for her little brother and how Katie manages her pain of her sister’s illness. I will definitely recommend this to my tween and middle school students. 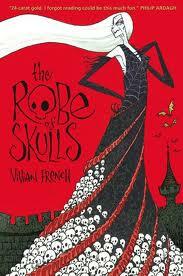 For those of you in search of a fun, fairy tale fantasy, you may enjoy The Robe of Skulls. 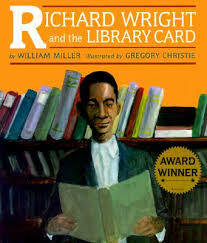 I think this book would work best for third and fourth grade readers. Robe of Skulls is the first of a series of four books in the Tales of the Five Kingdom’s series. Lady Lamorna has ordered a new fabulously creepy robe of skulls from the Ancient Crones. Unfortunately, this wicked sorceress’s trunk of gold is empty. She has no money to pay for her robe. What will she do? Why, devise a nasty scheme to turn all the royal princes and princesses into frogs and ransom them, of course. Little does Lady Lamorna know as she sets out on her evil mission with her troll, that she will meet a very evil stepsister who wants to steal the money Lady Lamorna earns and a young girl named Gracie Gillypot who might just foil her plans. 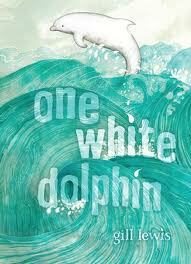 One White Dolphin is an environmental story based in Cornwall, England. Kara Woods is a girl who lives with her father at her aunt and uncle’s house. Her mother, a marine biologist and environmentalist, disappeared while on a scientific mission. Kara is bullied at school by the sons of powerful fishermen whose parents opposed her mother’s efforts to save the local reef from destruction and dolphins from being caught in fishing nets. When an albino dolphin calf washes ashore, Kara and her new friend Felix team up to help the dolphin survive and to fight to save the reef that fishermen will destroy as they dredge it to find scallops. I found myself rooting for Kara on her quest to save what her mother had fought so hard for. There are several exciting and suspenseful scenes that I really enjoyed as well. I’d recommend this book to tweens and middle school students. Here’s a great non-fiction book for enthusiasts of the pre-historic era. It begins with an important discovery by two boys just north of the Arctic Circle in 2007. Two boys found a frozen baby mammoth. 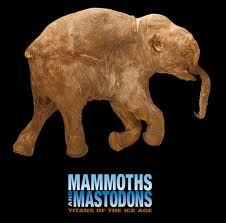 The mammoth, later named Lyuba by scientists, died nearly 40,000 years before and was fully intact. In addition to the photographs throughout the book, there are interesting panels of information, like: Did dinosaurs and mammoths live at the same time? and Do these elephants and mammoths seem almost human? This book is targeted toward upper elementary and middle school readers and would be a great book for students interested in prehistoric animals or modern day elephants. Here is an old fashioned but very sweet book that is always a hit with my preschoolers. Although the illustrations are dated, there is good preschool-level suspense when Danny goes into the woods to talk to a bear. Danny wants to buy a gift for his mother for her birthday. 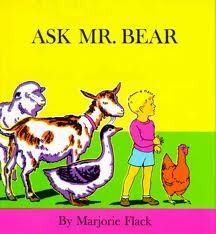 He asks a hen, goose, goat, sheep, cow and then finally a bear what to give his mother. The bear gives the best answer, a hug. One of my favorite genres is the graphic novel. I have many students who are graphic novel devotees and will read anything written in this format, including mythology and American history. My students are big fans of The Olympians series of graphic novels. They’ve read all the books in the series that I have in the library (Zeus, Hades, Hera, Athena and Poseidon). They are eagerly awaiting the newest book in the series, Aphrodite. Thank goodness for Graphic Universe and their series of Greek mythological tales. They’ve helped quench my students’ thirst for Greek myths. 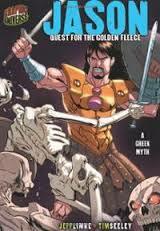 These graphic novels include myths like Jason: Quest for the Golden Fleece; Theseus: Battling the Minotaur; Trojan Horse: The Fall of Troy, Perseus: The Hunt for Medusa’s Head and others. While these tales are a quick read (I often get them back the same day I check them out), there are quite a few of them and they do a great job broadening my students’ understanding of Greek myths. Written by various authors and drawn by various artists, these books bring these stories to life in a dramatic and exciting way. I would recommend them to any mythology or graphic novel fan. This book was the book that made my kindergarten class sing last year. Baby Beluga is a great song song by children’s musician, Raffi. The book is part of the Raffi Songs to Read series. I love to sing, and singing Baby Beluga with a crowd of kindergartners is absolutely the best. We created hand movements and sang this book at every class time. The kids brought tears to my eyes when they performed Baby Beluga with their teacher at an assembly. I love “singing” this book to any young child. This book follows the song exactly as it is sung. Check out Raffi singing the song on YouTube to hear how the song goes. The illustrations by Ashley Wolff are sweet. Best yet, this inspired an interest in whales in my library! Off we were to discover more about Beluga whales, blue whales, gray whales and more! If you like to sing, Baby Beluga may just be the book for you.